First of all I have to apologise for not being prompt in updating... I hope you all did miss me. Well even thinking that it is optimism. I would be happy if you all actually did visit to see if there were any updates. I had to make a short trip to India.The journey was hectic but well rewarded by the mangoes and Sapotas (Chikkoo) Season. Enjoyed everyday on them.Though it was early in the seaoson and the best were yet to come I feasted on the raw mangoes.They are as delicious as fruits. Mangoes are originally from Southeast Asia, where they have grown for over 4000-6000 years. In India, mangoes are considered sacred and India is the world's largest producer of mangoes. Scientifically known as Mangifera Indica, these are part of the sumac family, and related to the cashew.There are thousands of varieties of mangoes which are available in a variety of shapes and sizes.Being season and delicious they are termed King of fruits. We lived in Mettur Dam ( Tamilnadu, Salem District)for a few years literally in a Mango grove. Each house had the bliss of one or two mango trees. The one in our house would produce on an average of 1000 to 3000 every season. It had become like a ritual to have mangoes everyday as a dish,and finally would be tired of eating it in others house too. Now, I am delighted at the sight of one mango and keep wondering looking at it, how could anyone get tired of such a sweet and amazing fruit. I did not long ago!!!!!!!!! This trip I brought back with me a few raw mangoes ..They were from the backyard of an acquaintance of ours.It was the fresh smell.. Cut one to find it was almost sweet.. nevertheless enjoyed it with some salt.The other one was sour as mango should be fit for Mavinkayi Chitranna, a typical dish of Yugadi ( New year according to Hindu Lunar calender ) festival in Karnataka. Everyone would relish this dish I can claim!!! Cook the rice and spread it on a plate and allow to cool. add a spoon of ghee.The rice should be cooked well but the grains should be separated not sticky ( Khila Khila chawal).Keep aside. Grate the raw mango. Grind together with Coconut, jeera, dry red chillies, salt, turmeric . The paste or chutney is the base. In a kadai, add the oil , when hot add the ingredients of seasoning.,. when the peanuts are reddish add the above ground masala and saute for a minute and put the heat off. Mix the above masala to the rice well . Garnish with some coriander leaves and freshly grated mango shreds. The delicious chitranna is ready to devour... serve with some papad, ( Happala/ Sandige ) .It is tasty on its own. ಚಿತ್ರಾನ್ನ, ನನ್ನ fav dish. ಇವತ್ತು ಅಡಿಗೆ ಏನು ಅಂತ ಕೇಳಿದ್ರೆ ನನ್ನ ಉತ್ತರ, ಚಿತ್ರಾನ್ನ! ಅದರಲ್ಲೂ, ಮಾವಿನಕಾಯಿ ಚಿತ್ರನ್ನ ಅಂದ್ರೇ ಪಂಚಪ್ರಾಣ. ನಿಮ್ recipeಗಿಂತ ಸ್ವಲ್ಪ ಬೇರೆ, ನಮ್ ಮನೆ ಮಾವಿನಕಾಯಿ ಚಿತ್ರಾನ್ನ. ಮಾವಿನಕಾಯಿ ತುರಿದು, ಹಾಗೇ ಒಗ್ಗರಣೆಗೆ ಹಾಕ್ತೀವಿ. ಸೂಪರ್ ಆಗಿರುತ್ತೆ. 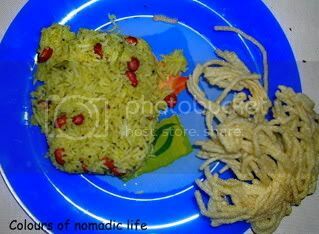 It is one of my favourites too Nagen.Will try the variation you said too. Should be as delicious. ಮಾವಿನಕಾಯಿ ಚಿತ್ರಾನ್ನ ಅಂದ್ರೇನೇ ಬಾಯಾಲ್ಲಿ ನೀರು. ಅದ್ರ ಮೇಲೆ ರೆಸಿಪಿ ಹಾಕಿ, ಅದೂ ಸಾಲ್ದು ಅಂತ ಮಾವಿನಕಾಯಿ ಚಿತ್ರ ಬೇರೆ ಹಾಕಿ, ಹೀಗೆ ಹೊಟ್ಟೆ ಉರುಸ್ತಾ ಇದ್ದೀರಲ್ಲಾ...ಸರೀನಾ ನೀವ್ ಮಾಡ್ತಾ ಇರೋದು? Hahaha Nilgiri,,, adondu illi parvagilla,,, In the season we get best of the fruits. maavinakaayi chitraanna aMda takShaNa saMDige nenapaaytu - muMde muMde hOdre adaraddE chitra haakiddeera. namage paravaagillappa - illi bahaLa oLLe quality maavinakaayi, maavinahaNNu sigatte. aapoos (alphonso) aMdre yaarige taane tiLiyOlla!!! Houdu sir... nija ,illi nanmage sigutte aadre selected stores nali olleyavu, adoo tumba expensive bere... sumne king of fruits antarye?